Please indicate if you will attend and if you will bring a guest. Our very popular annual picnic and fund raising auction for Members and guests will be, once again, at the home of David and Karen Williams. It's a lot of fun and our single biggest fund raiser for our Club's treasury. You will go home with a good meal, good fun and some good deals on wood and vendor donations that you will bid on. Picnic: the main dishes off the BBQ will be hamburgers, hot dogs and Steve Newberry's famous brisket. If you have special dietary needs, please bring those items. Please bring for sharing a side dish such as potato or macaroni salads, baked beans, watermelon or a desert, including your own beer or wine. The Club will provide water and a selection of soft drinks, paper plates, cups, napkins and utensils. Arrive anytime after 11am with the plan to start eating by around noon. Auction: Auctioneer Dave Colsen will bring his lively banter to entice and humor us to loosen up our purse strings. We will have for the auction: wood turned items donated by members like you, wood cut/sealed, donations from vendors like D-Way Tools, Boxmaster Tools, RoboHippy, Rockler, NW Woods and Woodcraft. 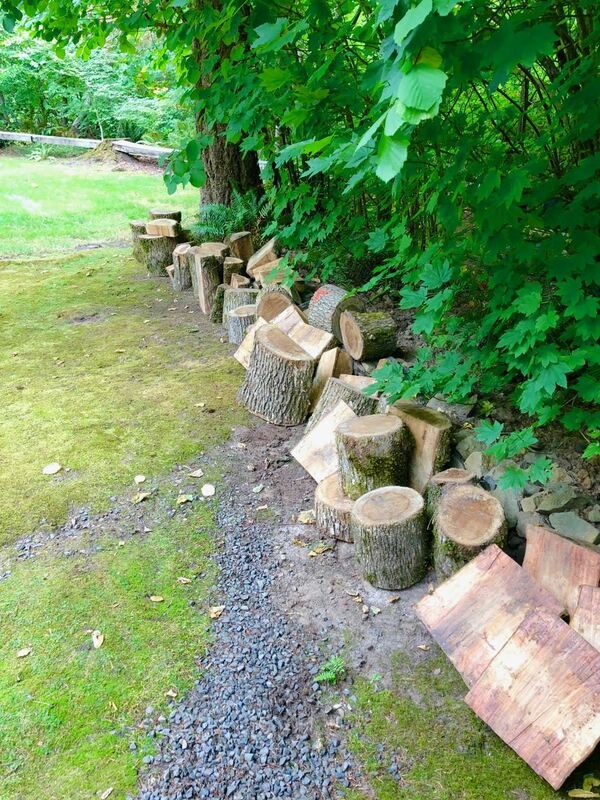 We have some very nice Oregon white oak cut and other common species that have been donated. Here's a photo of wood taken to the Williams' home just today: Oak and Apple! A finished wood turned item to donate for the auction, if desired. Wood blank(s), cut to a manageable size and sealed. No monster logs, please! As soon as registration is enabled you will be notified by email. Note: any wood you bring that does not sell, we ask you to take home.